Where to Eat in Farnham? | Curchod & Co.
Where to Eat in Farnham? With the biggest beer garden in central Farnham split over 3 levels, the largest of which can sit 200 people, The Mulberry is perfect for holding charity events or BBQs and offers an extensive burger menu with 20 gourmet options along with salads, baguettes and a lunchtime menu to quench that thirst. In a hurry? The Mulberry also offers a take-out option on their tasty burgers. Offering a local-sourced, British menu with a modern twist, Bears café and restaurant has recently been establishing itself as one of Surrey’s places to entertain over coffee, or enjoy a nice traditional English breakfast. We particularly love the cosy relaxed ambience that is created by the various seating areas, as well as the mezzanine level which is the perfect place to catch up on the latest news in the Financial Times. Situated in the stunning Castle Street, this French brassiere is the ideal spot to enjoy a delicious dinner. Blazing log fires, a gorgeous Georgian building and three light and airy inter-leading dining rooms help to create a relaxed atmosphere. The Brassiere Blanc also offers private dining in their first floor dining room which is also available for business meetings. If you have clients with specific dietary requirements such as vegetarian, gluten or dairy free, then this is the place to go with a whole menu that is guaranteed to satisfy their taste buds. This stunning restaurant features oak floors, lots of character, a conservatory and an outdoor patio which seats up to 40 and is the perfect place for al-fresco dinning during warm Summer evenings. In addition, Loch Fyne can also cater for private dining events, has a separate bar area as well as a fishmonger counter. Their à la carte menu offers an excellent range of fresh and seasonal seafood dishes. If you fancy trying something different for Breakfast, then Loch Fyne’s menu offers Lobster Benedict for £10.95 or alternatively you may prefer to try something sweet, in which case, they offer fluffy warm American style pancakes with your choice of banana, cream, blueberries, maple syrup or crispy bacon, blueberries and maple syrup butter from £5.50. Situated in Castle Street this Italian restaurant comprises exposed wooden beams, brick walls, character and a separate mezzanine floor, which is available for private parties. If you are looking for tasty, authentic dishes which include pizza, pasta and risotto along with fresh salads and indulgent desserts in a uniquely designed restaurant, then Zizzi should defiantly be at the top of your list. In addition to their standard menu, Zizzi also includes both vegan and vegetarian options. This dog and child friendly country pub can be found in Lower Bourne and is hidden within a four acre wooded garden on the edge of Farnham. 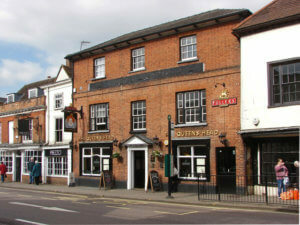 They serve a good selection of pub food, real ales and great wines. The location of the pub makes it ideal for weekend walks in the countryside. If it is high street chains that you are seeking, then Farnham town also has an extensive list of well known eateries which include Giggling Squid, Zizzi and Bill’s Farnham, as well as many more.